What do you get, when you put a lot of people from the blogosphere, who normally just type what's in their head, on their little space of the web, or the readers of those, in one guild? Lots of friendly people, just talking away, doing stuff on low level characters. 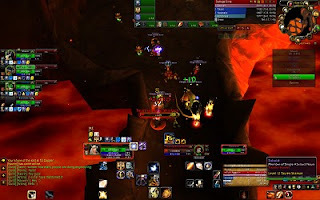 Ragefire Chasm, Deadmines and Shadowfang Keep become nice again. The party considered of Tobold (Tobold's MMORPG Blog), Hadawako(Fail PUG! ), Randomaia (blog-reader) and Shasti (no idea, adding later). Of course, I also pugged a lot. One run to Wailing Caverns again teamed me up with Randomaia, I think it lasted 2 hours, going through several healers and dps, because they didn't realise it would take that long. Or as Randomaia said; " I think my beard grew 2 centimeters during this run"
Gowron is now lvl25. He is specced into ret-tanking. Seal of Command at low levels is a very good threat-machine, together with faster judgements. I also took the Glyph of SoC, less mana-problems, means faster runs (almost no drinking). Think I switch to full ret when Blessing of Sanctuary becomes available. On the Allie-side of AD: My Warlock started levelling again, and I specced her into Affliction. And tonight my Tree will be healing ICC10, if all goes well. Fester or that other one are on the menu.... or are we on theirs? One thing puzzles me though. All guides say, gem for haste. But my Nourish (and GCD) is allready on 1.13sec. And that's exactly what my playing style needs. And being one of two healers, I am spamming Nourish a lot, so I actually gemmed for crit mostly. And it gives the benefit that most gear is interchangeable with Boomkin-spec. Can anyone enlighten me?